If you're reading this then you might already have noticed: for almost a couple of weeks now I've been running the free version of KISSinsights on kevinjoyner.com/blog. 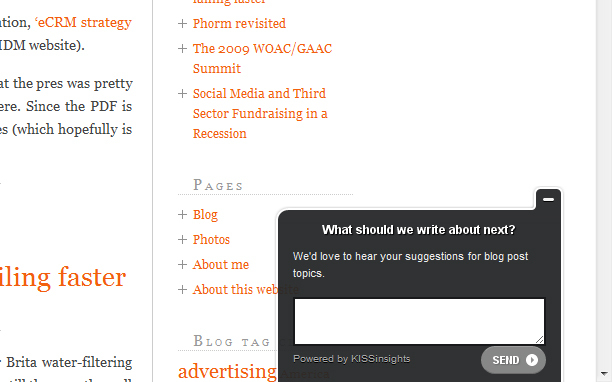 KISSinsights is a tool that can help you collect 'Voice of Customer' data about your website's visitors. 'Voice of Customer' research, essentially, is the use of surveys to give your visitors the opportunity to tell you, actively and consciously, what they think. It can be really useful for collecting new ideas about what your visitors want, or for revealing the reasons for performance problems. What really interests me though with voice of customer, is that conscious attitudes can be brought together with tracked behaviours: when someone tells you, for example, that they were disappointed with what they found on your website, you can understand more about that by bringing that attitude together with a record from web analytics data about how that visitor arrived at your site, what content they viewed, and what actions they took. This gives you much more power to act on your voice of customer responses. Similarly, if you discover in your web analytics data a 'problem' visitor segment based on traffic source, or content viewed, you could examine the voice of customer records for that segment in order to help you solve the problem. Web analytics can often tell you where a problem is, but on its own it doesn't often tell you how to solve it. My solution with KISSinsights and Google Analytics involves using Danny Ng's work to return a GA session ID into KISSinsights along side a visitor's response. The responses in the KISSinsights reports then include this ID. In GA, the session ID is not normally visible in reports, so I'm passing the same session ID also to my GA reports on a session scope custom variable. I hope you can see the value in voice of customer, and how that is multiplied by an integration with web analytics. If you're doing this already - differently, or better - then let me know!